Door and window sensors rank perhaps right up there with security cameras when most us think about critical features of home security systems. These sensors let your home automation controller know when a door or window is open or closed in order to trigger corresponding alerts, alarms. messages or actions. In addition to the standard phone alerts, you can also configure your system to trigger for local alarms via a connected siren alarm device when these sensors are triggered while your are away or asleep. Aside from the obvious security benefits for intrusion detection, connected door and window sensors can also allow you to quickly verify that all of your doors and windows are closed – and give you reminder alerts if a door or window remains open after a certain time at night. You can even set up a simple child monitoring capability by setting up your Z-Wave door sensor to trigger a short beep on your Z-Wave speaker whenever a door to the outside has been opened. These devices are relatively inexpensive and there are quite a few on the market from which to choose. Not only do these simple sensors combine with your home hub to create a quite capable smart window alarm and door alarm solution, your home hub can also integrate a multitude of other connected devices, such as leak detectors, smoke alarms, door locks, switches, and energy monitoring devices. See the DarwinsDen.com Best of the Home Automation Controllers review for a run-down of several of the popular and relatively inexpensive Z-Wave capable home automation hubs. Several of the most popular of these hubs can be purchased for under $100. Ok, it may not quite be all of them, but the following table summarizes and compares features of popular home automation Z-Wave door and window reed/contact sensors. 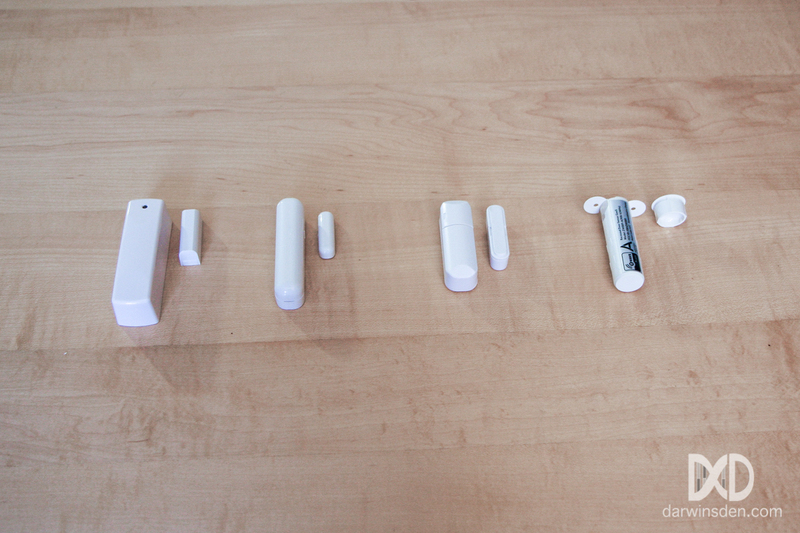 From left-to-right: Ecolink/Schlage, Fibaro, Lowes Iris Gen 2 (Zigbee), and the Aeon Labs Recessed Sensor. 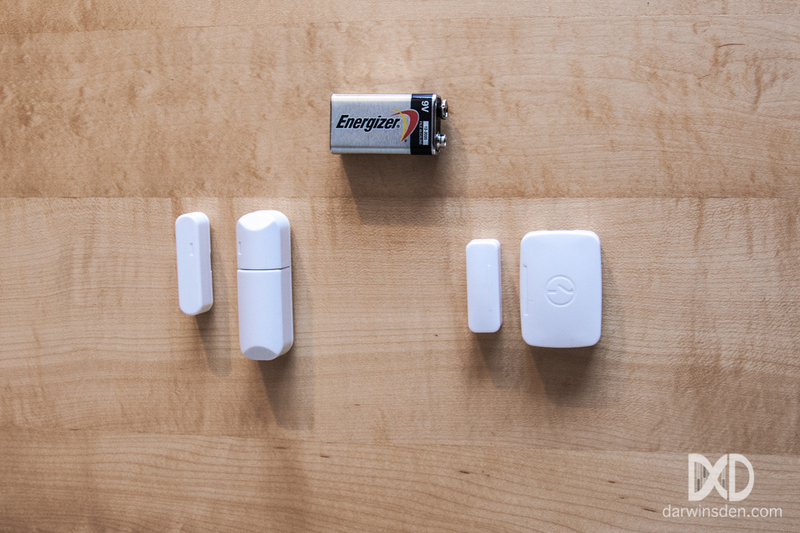 As useful as these sensors might be, replacing their relatively short-lived batteries can drive your average home automation enthusiast batty after a couple of years. This table includes battery life information as provided by the manufacturer. Surprisingly, I rarely come across great deals on multi-packs of these devices. I will update this post if and when I do. The information provided here is based on my research and/or testing and reader feedback. There may be discrepancies with the actual products. This table will continue to receive updates as data becomes available and new products are released. Suggestions on additional products or comparison features are always appreciated. 2. Dry bridge contact provides alternate means for triggering notification via an external no current connection. The Best Z-Wave Door and Window Sensor? While everyone has their own criteria for their ideal door and window sensor, my top pick is the Fibaro Modern Miniature Z-Wave Door/Window Sensor. 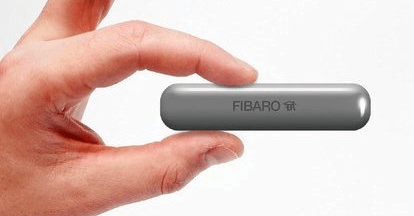 While the Fibaro is one of the more expensive options available, door and window sensors are typically one of the most visible components of a home automation and security system – and their aesthetics are an important consideration for many. The Fibaro is one of the smallest and most discreet products in its class and is available in seven colors to best match your door or window frame. If you don’t mind a little drilling, and aesthetics are a top priority for you, Aeon Labs provides the even more discreet and less expensive ZW089-A Z-Wave recessed door sensor that is installed hidden in the door frame. If aesthetics are of less concern to you than price, the slightly larger Schlage RS100 Z-Wave door/window sensor and the identical Ecolink DWZWAVE2-ECO are highly recommended, and typically less expensive alternatives. I’ve been quite pleased with the Sensative Strips ultra-thin Z-Wave+ Strips door and window sensor. At $55, it’s a bit more expensive than most other contact sensors, but my personal preference now is to use Strips sensors instead of other door and window sensors for installations where these sensors can be appropriately installed and where aesthetics is of prime concern – or where weather resistence is required. For a full review of the Strips sensor see the DarwinsDen.com Strips Z-Wave Door and Window Sensor Review. I generally recommend Z-Wave devices unless you are certain that your controller has been tested with specific Zigbee device variant, but the latest Zigbee Gen2 Iris Contact Sensor has worked well in my testing and is comparable in size to the Fibaro – at less than half the price. If you don’t mind a white sensor, you have an Iris or SmartThings Hub – or you know it is compatible with your controller, I highly recommend this Iris device. Zigbee alternatives: Iris contact sensor (left) and SmartThings multipurpose sensor. Samsung also offers their SmartThings Zigbee Multipurpose Sensor, which includes vibration, temperature, and open/close capabilities. Again, if you have a compatible zigbee capable controller, this is a great device for placing on a window frame to detect not only open close conditions, but also vibrations that could be the result of glass break attempt. In practice, I’ve found that due to false vibration alarms from the SmartThings sensor, its vibration detection capability is not as useful as I would have hoped. In addition to door and window sensors, you may also want to install a dedicated Z-Wave device that is capable of detecting if your window has been broken on windows that you are particularly concerned about. Although they have mixed reviews, both the Vision ZS5101 Z-Wave Shock, Vibration & Glass Break Sensor and the GoControl Glass Break sensor can provide this capability, and potentially with reduced false alarms compared to the SmartThings Multipurpose sensor. Great comparision but you missed Strips. Thanks Jocke. I’ve been following Strips’ progress on Idiegogo. I’ll add to the table and also test it out as soon as it is available in the US. If the price drops after awhile below the current £49.00 (~$70 US), it looks like it could be a great option for some applications. I’m not too bothered that its battery is not chargeable or replaceable. A similar or newer technology replacement unit will likely be available and relatively less pricey after it reaches its 10-year advertised battery life. EDIT 19 June, 2016: I’m still waiting for a US production release of the Strips Sensor, but I was able to put together this initial review of the Strips Sensor based on a prototype US frequency version that the folks at Sensative were able to provide me with. So far it looks to be a very impressive sensor and I look forward to its US production release. Sensative has just released their ultra-thin Strips Z-wave Plus door and window contact sensor for the US market. Although more costly than many other available sensors, my personal preference now would be to use Strips sensors instead of other door and window sensors for installations where these sensors can be appropriately installed and where aesthetics is of prime concern. See the DarwinsDen.com Strips Z-wave Plus Door and Window Sensor Review. From the strips manual: Strips will send a tampering alert if it detects that someone tries to wake up or manipulate Strips. Thank you! I’ve updated the table to add the Strips tamper detection capability.